If you are still waiting to upgrade to a new device, you might want to keep the Droid 3 in mind. Android Central recently reported on this device showing up in Verizon’s Device Management Pages. 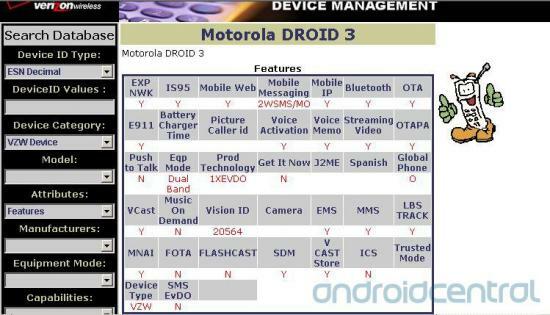 Though this information doesn’t mean much, it guarantees that the Droid 3 is indeed coming. All we know about the Droid 3 is that it will sport a 4″ qHD (960×540) display, dual-core processor, and will only have 3G, which is a disappointment when you consider how few LTE phones Verizon has on the market. So, re you excited for the Droid 3? Leave your comments below or on our Facebook page.